A first month of campaigning for ageing with equal rights! Online campaigning can be a frustrating activity. Millions of people are connected – and yet: who do we really manage to reach? We are now halfway in the #AgeingEqual campaign but already thrilled to say that the community of anti-ageism activists is growing! 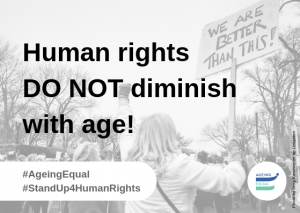 Faced with daily observations of the disastrous effects of ageism on older people, and building up on the 70th anniversary of the Universal Declaration of Human Rights that will be celebrated on 10th December this year, AGE Platform Europe decided that 2018 would be the year to give a boost to the fight for human rights in older age. On 1st October 2018, International day of older persons, AGE launched a global awareness-raising campaign on ageism. 70 years after its signature in Paris in 1948, the Universal Declaration of Human Rights remains equally valid today. 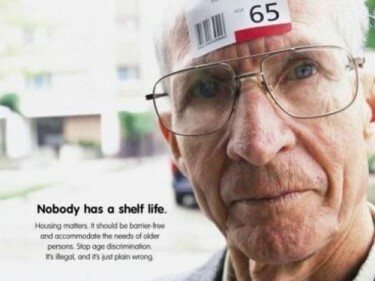 Similarly, older persons should never be denied their human rights because of their age! From Day 1, things got off to a good start with the campaign being supported by the United Nations Independent Expert on the Rights of Older Persons, the U.N. Office of the High Commissioner for Human Rights, the World Health Organisation, several Members of the European Parliament as well as many civil society organisations – including Human Rights Watch and HelpAge International, academics and activists. Since then, the movement only kept growing! 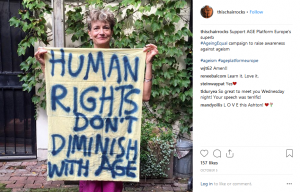 With the support of amazing ambassadors – first and foremost Ashton Applewhite, famous in the anti-ageism community for her Tumblr « Yo, Is This Ageist? 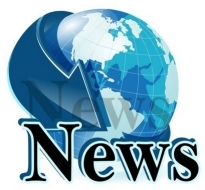 », the campaign is now being rallied by individuals and organisations showing their support and sharing their stories from Albania, Australia, Germany, Greece, Finland, France, Italy, Portugal, Russia, Spain, Sweden, the U.S., etc. the importance of intergenerational contacts to tackle ageism. Thanks to all of you who helped us kick start dynamically the #AgeingEqual campaign. This would not have been possible without your support and echo! More thematic focuses will rhythm the rest of the campaign: we will talk sexuality, racism, elder abuse, participation of older people and disability. Your further support and input to the campaign will again be crucial! Together We Can Make A Difference! Share your story using the hashtag #AgeingEqual and help us shine a spotlight on ageism. Join the movement on ageing-equal.org!